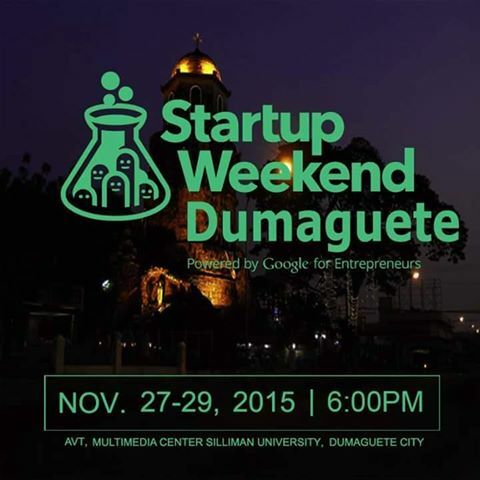 Aiming to cultivate technological entrepreneurship in Dumaguete, the first ever Startup Weekend Dumaguete 2015 will be held on November 27-29. “We want to introduce the local community to the idea that it is possible to locally grow alternative businesses that use non-traditional business models,” said Danah V. Fortunato, Executive Director of ICT Association of Dumaguete and Negros Oriental (ICT DGTE). The inaugural SW Dumaguete is a 54-hour event that begins with participants pitching startup ideas, developing such concepts into feasible businesses, and presenting them to judges on the final day. Winners will have their business ideas undergo development for possible launching to the market. SW Dumaguete will be at Audio-Visual Theater 1, Multimedia Center, Silliman University, Dumaguete City. The event was pushed for by Fortunato, Randolf Bandiola, along with members of the local tech community and the support of ICT DGTE and Department of Science and Technology Information and Communications Technology Office’s (DOST-ICTO) Mon Ibrahim and Emmy Delfin. The goal of the event is to “make the local business and education community aware of what start-ups are for as exposure to SW will help them grow the skills and talents needed by the startup community” said Fortunato. “Ultimately, we want the community to have an idea of the depth and breadth of the talent and skills that is found in Dumaguete,” she added. Launched in 2007 in the United States, Startup Weekend events have been hosted in 400 cities in over 100 countries all over the world. It is designed to inspire, encourage, educate and empower individuals, teams and communities that are into startups. Judges for the event are: Frederick Amores, Director for DOST-ICTO Visayas Cluster 1; Ed Du, President of the Negros Oriental Chamber of Commerce & Industry; Marc Aguilar, Production Director of Sci5 Development Asia Inc.
Mentors and coaches are: Robert Reyes, Founder & Chief Technology Officer of TurfSite Web Services; Jonathan Lansangan, co-founder and COO of Dynamic Objx; John Martin Figuracion, Co-founders and Chief Information Officer of ProTEEs Project; Dom Cimafranca, faculty member of the Computer Studies Division of Ateneo de Davao University; Alvin Juban, Director for Business Development for Synergy88 Digital Inc.; Clarisa Briones, Founder and CEO of Pinoy Great Deals; John Buie, Chief Marketing Technologist. Gold sponsors are: Sci5.com, Freelancer.com, PLDT and ICT Association of Dumaguete and Negros Oriental. Silver sponsors are: Global Tech Marketing Group, Trabahante.com, DomainMarket.com, Grassroots.org and Silliman University.